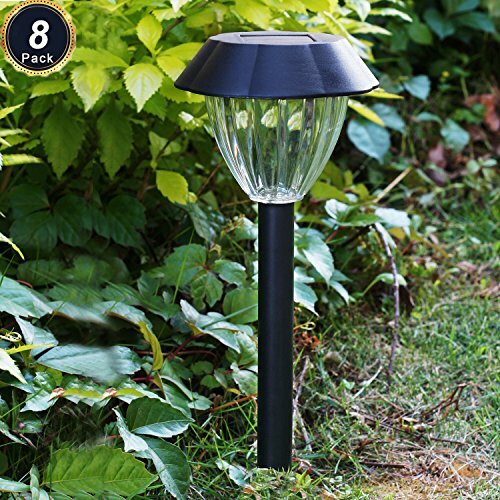 Enjoy all night lighting in your garden with the Super Bright Solar outdoor black garden pathway lights from SUNWIND. The durable all-weather plastic construction features a powerful 6 lumens output for optimal light. These outdoor driveway lights are solar powered so there will be no need to wire these lights up or plug them in. Auto charging by the sunshine during the day, and giving you up to 8 hours of light each night. Environmentally conscious lighting choice! Strictly quality inspection and test before production, during production and after production.100% weather-proof, corrosion resistant and IP44 waterproof ensure long-term outdoor using. We provide our products a 24-Hours Customer Support, 30-Day money back and 1-year quality guarantee. 1. Twist open the cap to remove the isolator tab before use. 2. Make sure the solar panel baths in direct sufficient sunlight for 8 hours. 3. The solar light usually illuminates for up to 8 hours with a full charge. However, it also depends on the geographical location, weather conditions and seasonal light availability. 4. If the soil in your garden is quite solid, we recommended that you should make a hole on the ground before inserting the spike. SUPER BRIGHT LED DESIGN: Star pattern light effect on the ground with 6 lumens super bright illumination to beautify and lighten up your garden every night! 100% WEATHER-PROOF: Designed to withstand sunny days, rainy nights, and small snowy days. The durable all-weather plastic construction prevent these solar path lights get rust or water or dust inlet. SPECIFICATION: Products display measures 4.72'' in diameter and 15.16'' in height. Each lamp contains 1 warm white 6 lumens led each and 1 AA Ni-MH 500mAh battery. Highest energy conversion crystalline solar panel to fully charge battery quickly and efficiently. EASY INSTALLATION: No wires! Simply pull out the isolator under solar cap and push the stake into the soil. The solar path lights automatically turn on at night and turn off at dawn! MONEY-BACK WARRANTY: If you are not satisfied with the Solar driveway lights, just return them within 30 days for a full refund.